Last night I was able to get back to the sewing machine for a little while (R. doesn't let me spend too much time away from him ... not that I mind!) and finish this quilt. After I hand-stitched the binding I realized that I'd sewn the squares too close to the edges and they were likely to fray and completely fall apart. 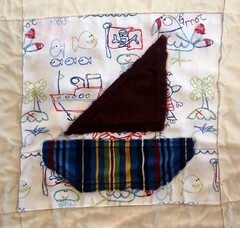 I went back and stitched again inside of the original stitching on all the sailboats. Lots and lots of twisting and turning of the quilt in the machine but I think it was absolutely necessary. And then I washed it to get that frayed edges look I was going for. That was when the little storm came upon me and my sailboats ... and one, just one, bled. I may try to wash the quilt again with that bleed color remover stuff, I haven't decided. Thank you for all your kind words, thoughts, and prayers about my family situation. It means the world to me. I love the bright colors. Very cute. That quilt is almost as sweet as those little toes below. Ugh the little peely feet so remind me of those first days of my little one. Aww very cute. It is so depressing when a finished item bleeds...what can you do? after reading this i'm a little worried about my little christmas quilts. i'm wondering if i'm sewing too close to the edge. have you had problems with fraying and things like this coming apart? Cute quilt! I love the colors. 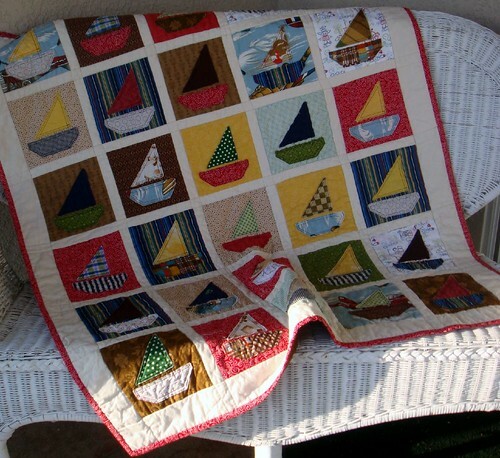 I googled a sailboat quilt and came across yours. I love it. I am trying to attempt your quilt. I know it was several years ago, but do you happen to remember the size of your quilt blocks? (I'm a beginner quilter and I need all the help I can get.) Thank you! !